In Japanese language, the abacus is called soroban. In this tutorial, we are going to learn how to use the soroban. In Japan, students start learning how to use abacus formally in the third grade. Believe it or not, in these modern time, some tellers in Japan still use abacus. And when they calculate, they are almost as fast as when using a calculator. Or maybe even faster. Shown above is a figure representing a Japanese abacus. A Japanese abacus is composed of beads or counters. The counters at the top deck are called 5-unit counters, while the counters at the bottom deck are called 1-unit counters. The vertical bars holding the counters determine the place value of the numbers represented by the counters. From the right hand side to the left hand side are ones place, tens place, hundreds place, and so on. In some Japanese abacus, decimal numbers are included. You can represent a number using an abacus by moving the 1-unit counters up the bottom deck and/or moving the 5-unit counters down the top deck. Moving the 1-unit up adds 1, 10, 100, etc. depending on the place value, and moving a 5-unit down increases the value of the number by 0.5, 5, 50, 500 and so on, depending on the place value. In this section, we are going to learn how to represent numbers using the Japanese abacus or soroban. 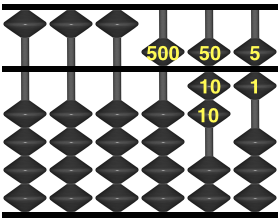 The starting position of the Japanese abacus is shown above, where all 5-unit counters are stacked at the top, and all 1-unit counters are stacked at the bottom. 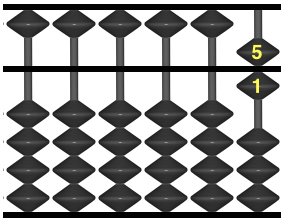 Example 1: The abacus represents 2 because two 1-unit counters were moved to the top of the bottom deck in the ones place. 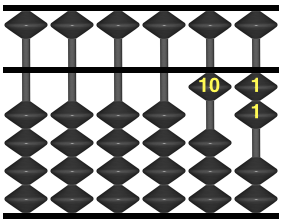 Example 2: The abacus represents 6 because one 1-unit counter was moved to the top and one 5-unit counter was moved down the top deck. 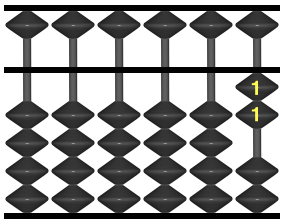 Example 3: The abacus in this diagram represents 12. One 1-unit counter in the tens place was moved up, so its value is 10. Next, two 1-unit counters were moved up, so their value is 2. 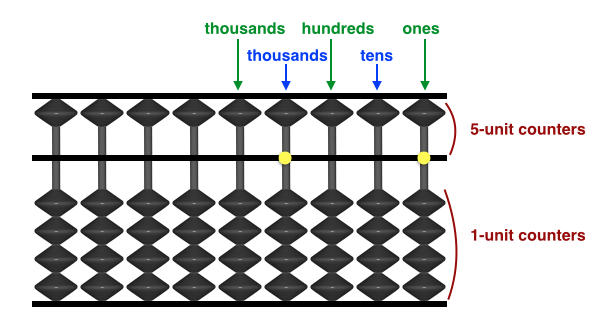 Example 4: The ones unit represents 6, the tens unit represent 70, and the hundreds unit represent 500, so the value represented by the abacus is 576. Example 5-6: Below represent 1 264 and 30651. Can you see why? That’s all for now. In the next post, we are going to learn how to add and subtract using the Japanese abacus. Note: If you want to learn more about Japanese abacus, you might want to to read How To Use A Japanese Abacus: A step-by-step guide… (affiliate link). Credits: The images in this post were taken from the Mr.Giorgio Arcidiacono Online Virtual Abacus.